Nigeria striker Brown Ideye says he is happy to carry on playing for Greek champions Olympiakos and is not tempted by the financial lure of China. The 27-year-old international says he rejected an offer in February to play in the Chinese Super League. "It was unbelievable money for the club and financially tempting for any footballer but I chose to stay here," he told BBC Sport. "My family love it here, and clearly happiness comes before money." Brown Ideye was part of the Nigeria squad at the 2010 World Cup and at the 2013 Africa Cup of Nations but has not played for the national side since a coming on as a substitute in a friendly against Italy in November 2013 that ended 2-2. A host of high-profile names, including Colombian striker Jackson Martinez, former Chelsea midfielder Ramires, Fredy Guarin, Ivory Coast forward Gervinho, Cameroon captain Stephane Mbia and compatriot Obafemi Martins recently made switches to the Far East. But Ideye, who joined Olympiakos from West Bromwich Albion last summer and has 10 goals in 30 appearances so far this season has no desire to join their number. His goals and assists helped Olympiakos clinch a record-extending 43rd Greek Super League title in late February. It was their 18th title in the last 20 seasons and was their earliest they have ever wrapped up the title. 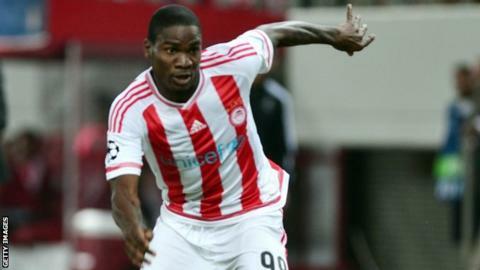 After winning his first league title in European football, Ideye wants to win more honours with the Greek giants. "From where I come from [Nigeria] it's easy to hear people say go to China for the money but I'm happy here," he continued. "Honestly I don't have (a genuine reason to) leave Olympiakos. I have been shown love and this is the place to be right now. "My ambitions are the same as Olympiakos' because I came to a club with a strong habit of winning titles and playing regularly in the Champions League. "I have individual goals and team goals; with the family atmosphere and strong fighting spirit within the club I believe we can achieve great things together. "I want to continue winning trophies here and make a big contribution to the history of this great club." Ideye scored 34 goals in 74 league appearances during his three seasons with Ukrainian side Dynamo Kiev before moving to England in July 2014. But the Super Eagle had a disappointing and injury-hit season in English football after signing for a then club-record fee of £10 million at West Brom. He only made 31 appearances in all competitions scoring just seven goals for the Baggies, but has quickly put his disappointing spell at the Hawthorns behind him. Ideye made his international debut for Nigeria in August 2010 and has scored five goals in 24 appearances for the Super Eagles. In 2013, he helped his country clinch their third African Cup of Nations title, scoring in the 4-1 semi-final victory over Mali. A member of their 2010 World Cup squad in South Africa, Ideye was omitted from the Super Eagles squad that reached the second round at the 2014 World Cup in Brazil.